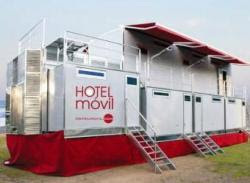 This mobile hotel is a new project from Spanish Company, Hotel Movil. Hotel Movil has created a mobile hotel on an 18 wheel truck trailer. Once parked, just detach the cab and press play on a handheld remote control. This movable hotel deserved a praise for their innovation. Hotel Movil comes in a form of a large truck trailer. This truck trailer is able to move to any location and it can be turned into a two level hotel within 30 minutes. After the setup 11 rooms are unfolded, complete with private bathrooms and even a second-floor outdoor terrace. The hotel on wheels have capacity for up to forty people, making it large enough for wedding parties, family reunions or luxury camping trips with a large group of friends. Every room in this mobile hotel has a bathroom, plasma screen TV, DVD, internet access and more. Depending on the trailer's configuration, a bar and movie screening room can also be included. Price for a weekend is EUR 7,000. Hotel Movil is available for EUR 400,000. 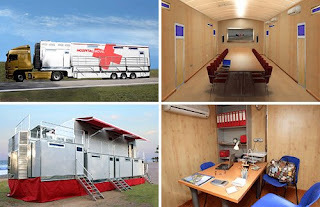 The whole rig can be purchased for around $500,000 or rented for $8,000 a weekend.